Escherichia coli can respire anaerobically using dimethyl sulfoxide (DMSO) or trimethylamine-N-oxide (TMAO) as the terminal electron acceptor for anaerobic energy generation. Expression of the dmsABC genes that encode the membrane-associated DMSO/TMAO reductase is positively regulated during anaerobic conditions by the Fnr protein and negatively regulated by the NarL protein when nitrate is present. The regions of dmsA regulatory DNA required for Fnr and NarL interactions in response to anaerobiosis and nitrate, respectively, were examined. Mutations within the Fnr site that deviated from the wild type sequence, TTGATaccgAACAA, or that removed an entire half-site, either impaired or abolished the anaerobic activation of dmsA-lacZ expression. The region for phosphorylated NarL (NarL-phosphate) binding at the dmsA promoter was identified by DNase I and hydroxyl radical footprinting methods. A large 97 bp region that overlaps the Fnr and RNA polymerase recognition sites was protected by NarL-phosphate but not by the non-phosphorylated form of NarL. Hydroxyl radical footprinting analysis confirmed the NarL-phosphate DNase I protections of both dmsA strands and revealed 8–9 protected sites of 3–5 bp occurring at ten bp intervals that are offset by 3 bp in the 3' direction. These findings suggest that multiple molecules of phosphorylated NarL bind along one face of the DNA and may interfere with Fnr and/or RNA polymerase interactions at the dmsA regulatory region. The interplay of these transcription factors insures a hierarchical expression of the dmsABC genes when respiration of the preferred electron acceptors, oxygen and nitrate, is not possible. Escherichia coli like many enteric and soil bacteria can respire anaerobically by using a variety of amine-N-oxides and methyl-sulfoxides as electron acceptors. This ability depends on the regulated synthesis of a membrane bound DMSO (dimethylsulfoxide) and/or TMAO (trimethylamine N-oxide) reductase enzyme. Use of these compounds in E. coli occurs by a broad substrate enzyme encoded by the dmsABC operon located at 20 minutes on the chromosome [1–3]. The 100-fold activation of dmsABC gene expression in response to anaerobiosis is controlled by the Fnr regulatory protein . Following a re-examination, the dmsABC P1 transcription start site was located 223 nucleotides upstream of the translational start of dmsA[5, 6]. This centers the Fnr binding site (TTGATnnnnAACAA) at -41.5 bp from the dmsABC P1 promoter as also established by DNase I footprinting analyses [7, 8]. The presence of nitrate, a preferred alternative electron acceptor, elicits a 10-fold repression of dmsABC expression via the NarXLQP two-component regulatory system [4, 9, 10]. Nitrate is detected by either of the two sensor-transmitter proteins, NarX or NarQ, which then activate the DNA binding response-regulatory protein NarL, by phosphorylating an aspartate residue located at position 59. NarL-phosphate then negatively regulates dmsABC operon expression . Additional regulators of dmsABC expression have also been described that involve molybdenum dependent gene expression via the ModE transcription factor, and integration host factor (IHF) that interacts with DNA at a downstream site called P2 [4, 6, 11, 12]. Neither the presence of TMAO nor DMSO, substrates for the DMSO reductase, further modulate dmsABC gene expression [4, 6]. In this study, the control of dmsABC gene expression by Fnr and NarL was investigated. Mutagenesis of the Fnr recognition sequence at the dmsA promoter region confirmed the contribution of Fnr in the 100-fold activation of dmsABC expression and explored the DNA sequence and spacing requirements for the Fnr recognition site at the P1 promoter. The region of dmsA promoter DNA protected by the NarL regulatory protein was identified by DNase I and hydroxyl radical footprinting experiments. These studies define the molecular interactions of Fnr and NarL at the dmsABC P1 promoter that together provide for the oxygen and nitrate regulated expression of this respiratory pathway operon. To investigate the effects of sequence changes in the dmsA Fnr-recognition site on the anaerobic activation of dmsA-lacZ expression, site-directed mutagenesis and β-galactosidase assays were performed (Figure 1). Since the native Fnr binding site at the dmsA P1 promoter differs from the Fnr consensus recognition sequence (TTGATnnnnATCAA ) by one base pair (bp) in the right half-site (e.g., AA CAA vs. ATCAA), the Fnr-site was converted to the consensus sequence and analyzed for β-galactosidase activity under both aerobic and anaerobic conditions. A 3-fold increase in anaerobic activation of dmsA-lacZ expression was observed for the consensus Fnr site (300-fold) relative to the 114-fold anaerobic activation by Fnr seen for the native dmsA sequence (Figure 1, λJA303 and λJA250, respectively). The λJA303 consensus mutant fnr+ strain exhibited a 1000-fold anaerobic increase in β-galactosidase expression relative to the corresponding fnr- strain (i.e., 22,200 vs. 19 units). To our knowledge, this "consensus" Fnr-dependent dmsA promoter exhibits the highest anaerobic induction of any Fnr-regulated E. coli promoter examined. The enhanced ability of Fnr to activate dmsABC gene expression is possibly, by analogy to Crp, due to increased affinity of Fnr at the consensus versus the native non-consensus Fnr recognition sequence at dmsA. Likewise, the poor match of the Fnr site at the promoter for the fumarate reductase gene, frdA to the consensus Fnr sequence may account for the relatively weak anaerobic induction for this respiratory operon . Nucleotide sequence at the dmsA P1 promoter region and the effects of sequence alterations in the Fnr binding site on dmsA-lacZ expression. The DNA sequence is shown in the middle portion of the figure and is numbered relative to the 5' terminus of the dmsA mRNA (not to scale). The transcriptional start site is located at the guanine residue positioned at 223 bp upstream of the dmsA translational start site and is indicated by the arrow at position +1. The consensus sequence of the RNA polymerase recognition sequences in the -35 and -10 regions are shown below the DNA sequence. The boxed sequences from position -35 to -48 indicate a 14 bp region of dyad symmetry similar to the Fnr consensus recognition sequence (TTGATnnnnATCAA). The location of Fnr-box mutations within the dmsA regulatory region and the corresponding phages carrying the dmsA-lacZ fusions are indicated in the lower portion of the figure. The effect of cis mutations on Fnr-dependent activation of dmsA-lacZ expression is shown in the lower right portion of the figure. β-galactosidase activity was measured from the cells containing the indicated fusion inserted in single copy at the att site. The strains were grown in a buffered LB medium either aerobically or anaerobically. The asterisk represents the fold difference between the fnr- and fnr+ strains. Several additional DNA sequence changes were introduced into the dmsA promoter region to alter the Fnr recognition sequence as well as to alter the spacing between the Fnr site and the RNA polymerase recognition sequences (Figure 1). A single base substitution in the left half-site when combined with the Fnr consensus sequence at the right half-site exhibited a 138-fold activation of dmsA-lacZ expression (Figure 1, λJA450), an induction equivalent to the wild-type dmsA promoter that has the symmetrical deviation in the right half-site (ca. 114-fold). Thus, the left and right half-sites are equivalent in their ability to confer Fnr-dependent activation of dmsA gene expression by RNA polymerase. This is in contrast to the requirement for the left half-site of the Fnr1 regulatory site needed for Fnr-dependent repression at the cydA P1 promoter . When a two base-pair change was introduced into the left Fnr half-site (e.g., TTGAT to TTAG T) of the native dmsA sequence, it nearly abolished the anaerobic induction of dmsA-lacZ expression (Figure 1, λJA257). The deletion of the entire left half-site Fnr sequence, while preserving the right half-site as consensus, exhibited similar results (λJA304). Hence, a single Fnr half-site is not sufficient to allow Fnr-dependent activation of the E. coli DMSO reductase genes. To evaluate how the spacing between the Fnr binding site and the start of dmsA transcription alters the anaerobic activation of dmsA-lacZ expression, single basepair insertions were introduced at position -35 (λJA448 and λJA449). The 114-fold anaerobic activation seen for the wild-type dmsA promoter was reduced to about 35-fold in each of the two mutants (Figure 1), indicating that the position of the Fnr site at the wild-type dmsA promoter is important for controlling optimal dmsA gene expression. Thus, the dmsA promoter exhibits a preference for -41.5 target sites like other Fnr-regulated class II promoters . By analogy to the CAP transcription regulator [17, 18], the proposed mechanism for Fnr activation of gene expression involves its ability to promote open complex formation by RNA polymerase [13, 16, 19]. As suggested by the appearance of DNase I hypersensitive cleavage sites, a change in the DNA conformation occurs upon Fnr binding at the dmsA promoter [7, 8]. The presence of hypersensitive DNase I cleavage sites at other FNR-regulated promoters as well as DNA bending experiments support this conclusion [8, 20]. Furthermore, recent studies propose the protein-protein interaction of σ70 and Fnr at the narG and dmsA promoters [7, 21–23]. Finally, for each of the site-directed mutations of the Fnr binding site in this study, the level of dmsA-lacZ expression was not significantly altered in an fnr deletion strain either aerobically or anaerobically, indicating that the Fnr-independent expression from the dmsA promoter was not affected by the sequence alterations (Figure 1). Under anaerobic conditions, dmsA expression is repressed approximately 10-fold by NarL when nitrate is present . Although three putative NarL sites have been proposed based on their similarity to a NarL consensus recognition sequence, TACYYMT (Y = C or T, M = A or C) [24–26], no in vivo or in vitro information is available regarding the location of the NarL site(s) within the dmsA regulatory region. To evaluate where NarL binds, DNase I footprinting experiments were performed using a dmsA promoter fragment corresponding to -127 to + 62 relative to the start of transcription at P1. When NarL-phosphate was incubated with the coding strand of DNA, a 76 bp region was protected that extends from position -48 to +28 relative to the start of dmsA transcription (Figure 2, open rectangle). DNase I hypersensitive cutting sites were seen at positions +32, +31, +30, +18, +4, -18, -19, -41, and -53 relative to the start of transcription. DNase I and hydroxyl radical footprint analyses of the dmsA coding strand by NarL and NarL-phosphate. The closed boxes denote the hydroxyl radical protected regions whereas the open box indicates the DNase I protected region. The asterisks note positions with increased sensitivity to DNase I cleavage when NarL-phosphate is bound to the DNA. Numbering of the DNA is relative to the start of dmsA transcription. The amount of NarL used in each lane is indicated above each lane. Lane G contains the Maxam-Gilbert sequencing reaction. The NarL protein used in Lanes 2 and 6–9 was phosphorylated with acetyl phosphate prior to incubation with the dmsA fragment. The DNase I footprint of the non-coding strand of dmsA with phosphorylated NarL revealed an 83 bp protected region that extends from -51 to +32 relative to the start of transcription (Figure 3). DNase I hypersensitive cutting was observed at positions +27, +4, +3, -10, -20, -21, -22 and -32. For the non-coding DNA strand, the size of the DNase I footprint pattern appears to increase when higher levels of NarL-phosphate are present. DNase I protection first occurs within the +10 to -15 region followed by an extension to the -25 to -50 region and then finally the +20 region. The size of the protected region did not change further when up to five-fold higher amounts of NarL-phosphate were used (10 μM, data not shown). Thus, the sizes of the protected regions on each strand concur. Furthermore, non-phosphorylated NarL gave no DNase I protections in the dmsA promoter region under the same conditions for either strand (up to 10 μM), suggesting that NarL-phosphate, but not NarL, can act as a transcriptional repressor for dmsA expression. The protections for both strands are consistent with the binding of multiple molecules of NarL to the DNA. DNase I and hydroxyl radical footprint analyses of the dmsA non-coding strand by NarL and NarL-phosphate. The closed boxes denote the hydroxyl radical protected regions whereas the open box indicates the DNase I protected region. The asterisks note positions with increased sensitivity to DNase I cleavage when NarL-phosphate is bound to the DNA. Numbering of the DNA is relative to the start of dmsA transcription. The amount of NarL used in each lane is indicated above each lane. Lane G contains the Maxam-Gilbert sequencing reaction. Lanes 1 and 5–8 designate the phosphorylated NarL protein. Hydroxyl radical footprinting of the NarL interactions with dmsA promoter DNA was also performed for both strands of DNA (Figure 2 and 3). In hydroxyl radical footprinting, the small, highly reactive hydroxyl radical (•OH) attacks the deoxyribose sugars along the DNA backbone with no sequence or base specificity, thereby providing a high resolution of structural information [27, 28]. A total of eight to nine distinct hydroxyl radical protected regions were observed of three to five basepairs in size for each DNA strand that extended over a 97 bp region (Figure 4). These NarL-phosphate protections extended from position -59 to +38, consistent with the results of the DNase I footprinting experiments described above. The hydroxyl radical protected regions for the dmsA strands of DNA were offset by 3 bp in the 3' direction (Figure 4). This offset suggests that the NarL protein either occludes the minor groove of DNA, or that the DNA conformation is distorted upon NarL binding. In the former case, the DNA backbone sites located closest to one another are across the minor groove and separated in sequence by 3 bp [28–30]. The second proposal is supported by a recent 2.2 angstrom NarL-DNA structure for NarL-C-terminal domain complexed to a synthetic 7-2-7 NarL consensus binding site where the protein causes a conformational change of B-DNA to A-DNA (Ann Maris, personal communication). Furthermore, the hydroxyl radical protected regions occur at ten bp intervals, a regular phasing of the helix repeat. This signifies that NarL-phosphate binds to only one side of the DNA molecule dmsA promoter region [27–30]. The hydroxyl radical data are also consistent with the binding of multiple molecules of NarL-phosphate to the dmsA promoter region as suggested by the DNase I data. Therefore, a simple model that accounts for the footprint data is the assembly of multiple NarL-phosphate molecules onto one face of the DNA that somehow protect the minor groove from hydroxyl radical attack [28–30]. In an alternative model, NarL binds only at the three proposed NarL heptamer consensus sites spaced at 20 bp intervals within the dmsA regulatory region (Figure 4). However, this model is difficult to envision since the DNase I and hydroxyl radical cleavage patterns extend over seven to nine turns of DNA. Location of the Fnr and NarL binding sites in the dmsA promoter region. The DNA sequence is numbered relative to the start of transcription. The dmsA Fnr recognition sequence is indicated by the open rectangle. The region of DNA protected by NarL-phosphate from DNase I cleavage on each strand is denoted by the brackets whereas the sequences protected from hydroxyl radical cleavage on each strand are represented by the closed boxes. DNase I hypersensitive sites are marked with asterisks. The RNA polymerase recognition sequences in the -35 and -10 regions are in bold italics. The three consensus NarL binding sites are represented by the solid arrows whereas dashed arrows mark NarL consensus sequences with one mismatch and dotted arrows signify two mismatches. By either of the above models, the location of the NarL-phosphate protected regions suggests that NarL may compete with Fnr and/or RNA polymerase for occupancy on the DNA but only when the bacteria are grown anaerobically in the presence of nitrate, conditions where NarL is in the activated form. 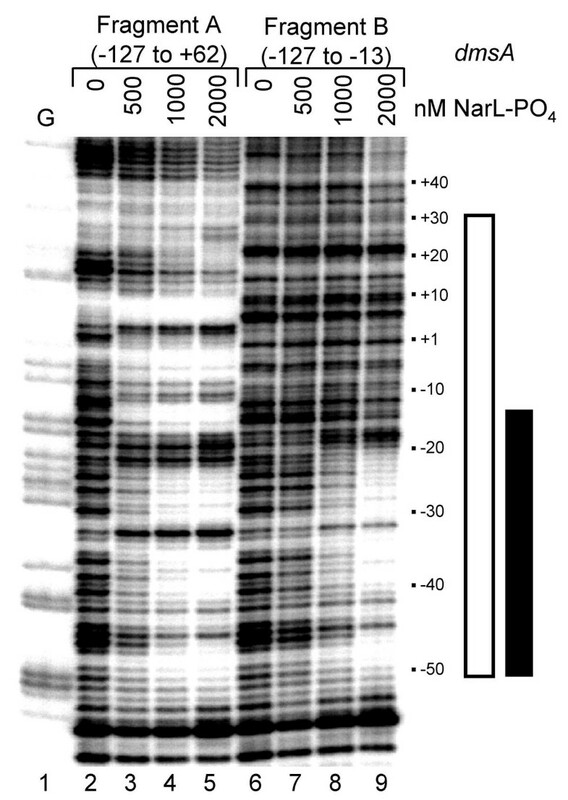 No hydroxyl radical or DNase I protected regions of DNA were observed when non-phosphorylated NarL protein was used at a concentration of 10 μM (data not shown). 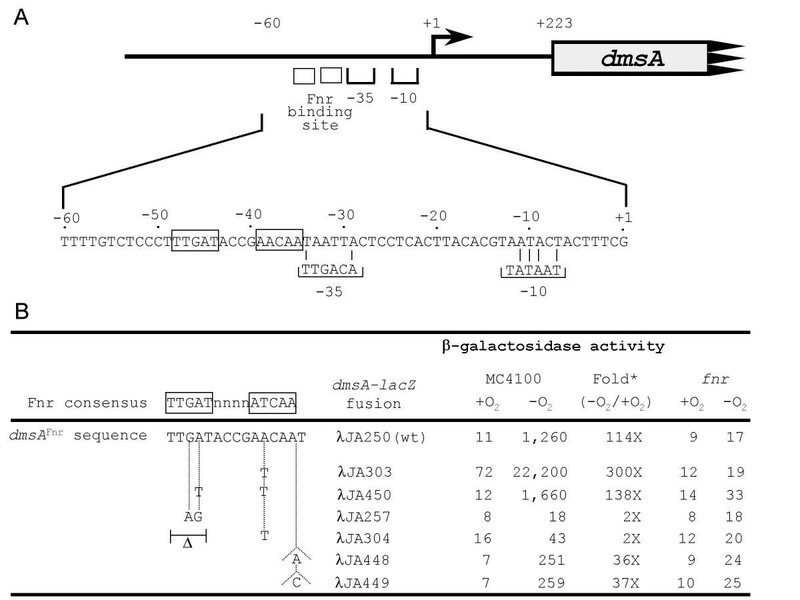 In addition, β-galactosidase assays revealed that the 10-fold nitrate dependent repression of dmsA-lacZ expression was unaffected by the deletion of upstream DNA sequence to -71 relative to the start of dmsA transcription, further pinpointing the location of the 5' end of the NarL recognition site for dmsA (data not shown). Furthermore, the NarL footprint pattern does not extend into the dmsA P2 promoter region. Therefore, NarL does not appear to directly affect regulation at the P2 site, unless a large DNA/protein complex that involves multiple transcriptional regulators is involved (i.e. Fnr, NarL, ModE, and IHF in addition to RNAP). Future investigation of this complex regulatory region will be needed to ascertain such a matter. Finally, a similar hydroxyl radical footprint pattern of 8–9 protected regions of 3–4 bp spaced 10 nucleotides apart was also observed for NarL-phosphate at the promoter region of the frdA gene, another anaerobically induced gene that is repressed by NarL in the presence of nitrate (data not shown). To establish if the entire NarL protected region is required for NarL-phosphate to bind DNA, a DNA fragment (designated Fragment B, Figure 5) containing a truncated region of the dmsA regulatory sequence was constructed. The fragment extends from position -127 to -13 relative to the start of dmsA transcription at P1 (Figure 4). In Fragment B, two of the three consensus heptamer sites have been replaced by the multi-cloning region of pGEM-11Zf (Methods). When examined by DNase I footprinting analysis, the altered dmsA Fragment B (Figure 5, lanes 6 to 9) revealed a 38 bp NarL-phosphate protected region extending from position -51 to -13. This protected region spans only the wild-type dmsA DNA sequences but not the adjacent foreign DNA sequences. In contrast, the full-length dmsA fragment (Fragment A, -127 to +62) showed a larger protected region from -51 to +32 (lanes 2–5). These findings demonstrate that the smaller dmsA region containing only one of the three consensus heptamer sites (Figure 4) is sufficient for NarL binding. However, a somewhat weaker binding of NarL-phosphate to the DNA fragment containing the truncated dmsA region relative to the full-length region may suggest that NarL binds at the promoter in a weakly cooperative fashion. The protections are consistent with the proposal that NarL-phosphate recognizes and binds at multiple heptamer recognition sites within the dmsA P1 promoter region. Comparison of the NarL-phosphate protection patterns for the entire dmsA promoter region versus a truncated dmsA promoter fragment. The open box denotes the DNase I protected region for the entire dmsA region (Fragment A, -127 to +62) whereas the closed box indicates the protected region for the truncated dmsA promoter region (Fragment B, -127 to -13). Numbering of the DNA is relative to the start of dmsA transcription. Lane G contains the Maxam-Gilbert sequencing reaction. 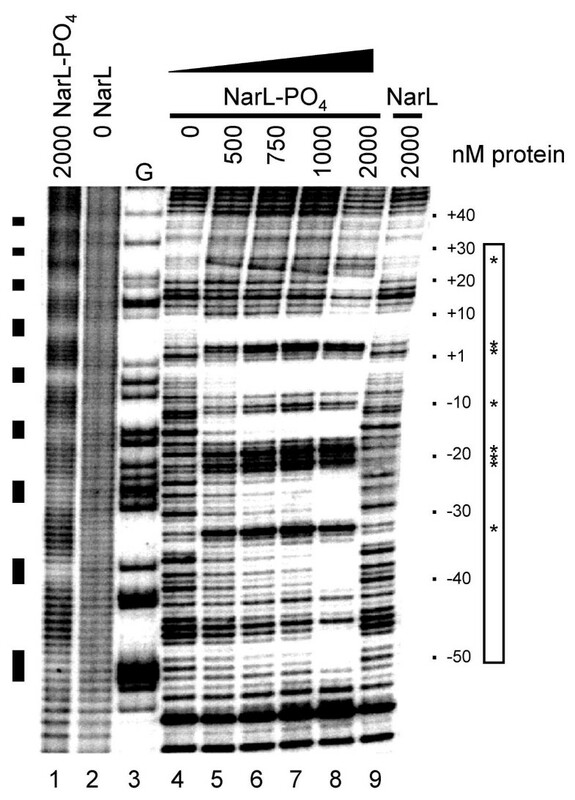 The noncoding strand of DNA was used in both fragments, and the NarL protein used in Lanes 3–5 and 7–9 was phosphorylated with acetyl phosphate prior to incubation with the dmsA fragment. The amount of NarL used in each lane is indicated above each lane. Three putative NarL binding sites with the consensus heptameric sequence (TACYYMT) have been proposed for dmsA. These sites, previously assigned at positions +8, -14 and -34, are now centered at positions + 15, -7, and -27 (Figure 4) due to the reassignment of the dmsA P1 start site [5, 6]. Since the size of the DNase I and hydroxyl radical footprints in this study show DNA protections between and beyond these three consensus sites, other NarL binding sites may be present in this region. As the three consensus NarL boxes flank the dmsA promoter and are spaced 20 bp apart (Figure 4), the spacing and orientation of the NarL protected regions make it tempting to speculate that NarL-phosphate binds at each site. Additional NarL-phosphate monomers then assemble on the DNA to form a stable DNA protein complex. Alternatively, molecules of NarL-phosphate may bind at both the consensus and at related NarL-box sequences that contain one or two mismatches from consensus (Figure 4). Inspection of the DNA reveals an additional NarL box within the protected region that has one mismatch from consensus (Figure 4, dashed arrows) and nineteen NarL-like boxes with two mismatches (dotted arrows, not all shown). We note that none of the three consensus heptamers (solid arrows, Figure 4) are arranged in a 7-2-7 sequence, nor are any of the consensus heptamers paired with any of the mismatch heptamers in such an arrangement. This is noteworthy since a 7-2-7 sequence has been speculated for nucleating NarL interactions at other promoters . Stoichiometry experiments are planned to ascertain the number of NarL molecules that bind the dmsA promoter region, as are studies to mutagenize one or more of the NarL binding sites to determine the importance of the NarL consensus binding sites at the dmsA promoter. This study investigated the effects of sequence changes in the Fnr-recognition site on the anaerobic activation of dmsA-lacZ expression as well as examined the NarL recognition sites within the dmsABC regulatory region. The data illustrates that Fnr is responsible for the 100-fold anaerobic activation of dmsA expression. Also, both half-sites of the Fnr recognition sequence at dmsA are required for Fnr-dependent expression and are similar in their ability to activate dmsA transcription. Furthermore, the spacing between the Fnr and RNA polymerase recognition sequences is critical at dmsA. In vitro interactions of the nitrate-responsive regulatory protein NarL with the promoter region of dmsABC were examined using DNase I and hydroxyl radical footprinting techniques. The location of the NarL-phosphate protected regions within a 97 bp segment of the dmsA promoter is consistent with the model for dmsABC expression whereby multiple molecules of NarL-phosphate recognize and bind to the DNA in a weak and cooperative fashion. The NarL interactions with the dmsA promoter region occurred at ten bp intervals and were offset by 3 bp in the 3' direction, suggesting the assembly of multiple NarL-phosphate molecules onto one face of the DNA that protect the minor groove. Furthermore, nonphosphorylated NarL was unable to protect the NarL binding sequences at the dmsA promoter region, suggesting that phosphorylation of NarL is required for repression of dmsABC expression. The genotypes of the E. coli K-12 strains, plasmids, and the bacteriophage used in this study are listed in Table 1 and Figure 1. Strains were maintained on Luria broth or solid LB medium . Ampicillin was added as needed at 100 mg/L. For β-galactosidase assays, cells were grown in phosphate-buffered LB medium . Aerobic and anaerobic cell growth was performed as previously described . To introduce mutations within or nearby the proposed Fnr recognition site at the dmsA promoter, site-directed mutagenesis was performed using the method of Kunkel . The template for mutagenesis was m13mp19-100 which contained a 676 bp Bam HI fragment containing 587 bp of DNA upstream of the dmsA translational start site and the associated 89 bp of the dmsA coding region. Each intended mutation was confirmed by DNA sequence analysis . A Hinc II/Bam HI fragment containing the regulatory region was excised from the M13 template and inserted into the plasmid pRS1274 to give the JA250 (wild type) and related mutant dmsA-lac Z promoter fusions (Figure 1). These fusions were inserted into the chromosome in single copy as previously described . β-Galactosidase activity was determined as previously described . The protein concentration was estimated by assuming that a cell density at OD600 of 1.4 corresponds to 150 μg protein per ml . 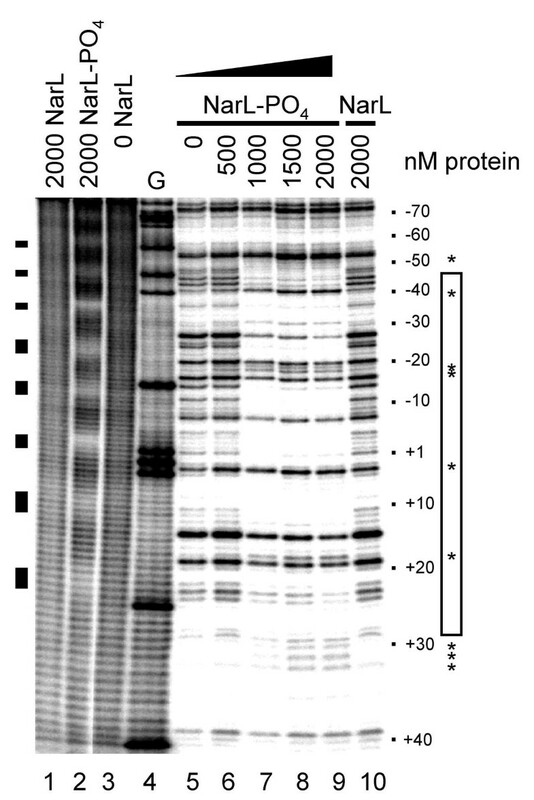 β-galactosidase activity is expressed in nanomol ONPG hydrolyzed per min per mg protein. Values for β-galactosidase activity represent the average of three or more experiments and the values varied no more than plus or minus 5% from the mean. A 189 bp DNA fragment containing the dmsA promoter region was used for DNA footprinting experiments. The fragment, corresponding to -127 to +62 relative to the start of transcription, was amplified by PCR using primers 5'GAACGGTCTAGAATATATTGGC'3 (oSB15) and 5'GGGAATTCGCTATATAGGCTTGTATACATCGAA'3 (oSB14) with plasmid pPC25 as template. The PCR product was digested with either the Eco RI or Xba I restriction enzyme, end-labeled with [αP32]-dATP (ICN, Inc.) using the Klenow fragment of DNA polymerase I, and purified using a PCR clean-up kit (Qiagen). A smaller DNA fragment representing the 5' end of the dmsA promoter region from position -127 to -13 relative to the start of transcription was also constructed by PCR amplification using pPC25 as template and oligonucleotides oSB15 and oSB21 (5'GTAGTATTACTAGTAAGTGAGG'3). The PCR product was digested with the restriction enzymes Xba I and Spe I and cloned intoXba I-digested pGEM-IIZf (Promega). Only the Xba I site designed near the -127 region remained intact. 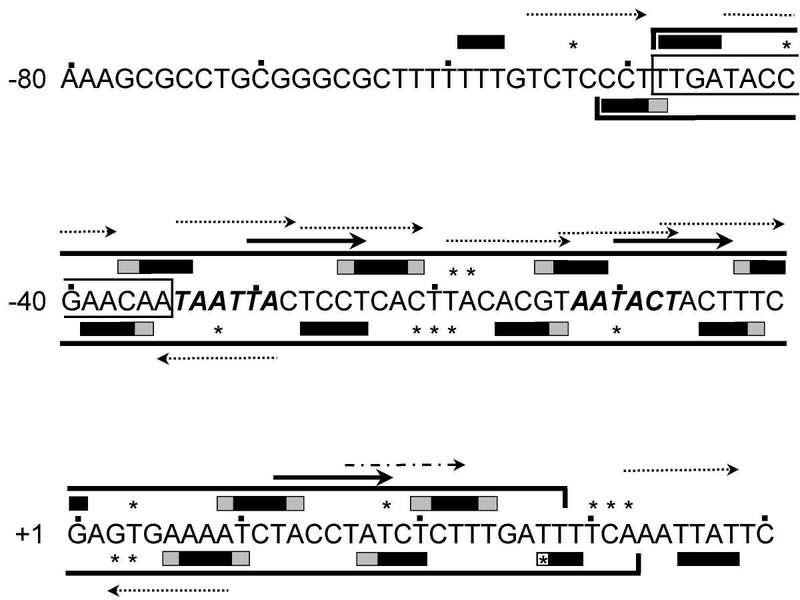 Using the resulting plasmid pSB10 as template, the cloned product was PCR amplified with the vector forward and reverse primers, digested with Xba I and labeled as described above, resulting in Fragment B (see Figure 5). DNase I footprinting assays were carried out in 30 μl of binding buffer (1 mM Tris, pH7.5, 5 mM KCl, 0.1 mM EDTA, 0.1 mM DTT, 0.7 mM CaCl2, 40 ng poly-(dI-dC), 12% glycerol) with a final DNA concentration of 2 nM. NarL was purified and phosphorylated using acetyl phosphate as previously described . Following phosphorylation, NarL was immediately diluted to the indicated concentrations and DNA binding was allowed to proceed at 22°C for 10 min. DNase I (Sigma) was added (2 μl of a 1:250 dilution of 10 mg ml-1 stock in water) and incubation continued for six min at 22°C. Reactions were stopped by the addition of 7 μl of stop buffer (0.1 M ETDA, pH 8, 1.7 M sodium acetate, pH 5, 0.1 μg poly-(dI-dC)). Following precipitation, the samples were resuspended in loading dye, subjected to electrophoresis on an 8% polyacrylamide gel containing 6 M urea, and detected by autoradiography. Maxam-Gilbert sequencing reactions were performed as described . Hydroxyl radical footprinting at the dmsA promoter was performed as described . NarL binding to the indicated DNA fragment was performed as described above, omitting glycerol from the binding buffer. Following the 10 min binding reaction, a freshly prepared DNA cleavage mixture was added (3 μl each of 20 mM L-ascorbic acid, 1.5% hydrogen peroxide, 20 mM iron (Fe+2) EDTA). After 1 min at 22°C, cleavage was terminated by the addition of 3 μl of 0.5 M thiourea and 7 μl stop buffer. The digestion products were precipitated and analyzed as described above. This study was supported in part by the Public Health Service grants GM49694 and AI21678 to RPG and a National Research Service Award F32 GM19730 to SMDB. We thank Paul McNicholas for helpful suggestions and comments. Author 1 (SMDB) performed the NarL studies and drafted the manuscript. Author 2 (JAA) carried out the Fnr studies. Author 3 (RPG) conceived of the study, participated in its design and coordination. All authors have read and approved the final manuscript.